The end of the Zipcar Low Car Diet is tomorrow. It was a complete and total success from my point of view. I didn’t drive the Civic a single time, and Lisa only drove it about 4-5 times, to go to doctor’s appointments and such. I ended up taking the bus four times, and biking the rest of the days. The experiment was such a success, I decided to run some numbers to see what it would be like to get rid of the car altogether. During the warm months, I can bike most places, so the costs of owning a car are pretty much only the insurance. But let’s look ahead to the colder winter months when I might not be biking as often. First, the current costs of the Civic. Insurance, now that I got a new policy, costs only $30/month. Gas is probably about $40-50/month. Maintenance and such, averaged out over the year, probably runs around $30-50/month as well. So we’re looking at anywhere from $100-150/month. Now, going car-free. Taking the bus every day would cost $2.50 a day. Averaging around 20-22 work days per month, it’ll cost about $50-55/month. Even looking at keeping the car and riding my bike every day (only expense being insurance at $30) versus riding the bus every day ($50), I’d only be saving $20/month, and obviously it’s not a fair comparison. At this point, it kind of looks like getting rid of the car is a good idea. There is one more thing though: extracurricular activities like curling. During the curling season, I usually play on Sundays and Mondays. When I play on Sunday, the whole family comes to watch and have pizza, so I wouldn’t need the car for that. On Monday evenings, I could take the Metro to a station in Maryland with a Zipcar and rent that for 3 hours or so. If I had a late game, I could even just drive the minivan (or the Zipcar from the Vienna station), since the Metro closes around midnight, and our games probably wouldn’t be done in time to Metro home. On those days, renting a Zipcar for 3 hours at $7-9/hour would cost $21-27/week, or about $80/month. Even with those numbers, it’s a close contest. $100-$150/month for the car versus $50 (bus fare) plus $80 (Zipcar) equals $130/month. Let’s also consider that selling our Honda Civic hybrid could get us about $13k. That could help accomplish any number of things. $13k would go a long way toward defraying the Zipcar costs. I could also upgrade the lights and such on my bike. Or, it could help pay off a good portion of the $20k we have left to pay on our minivan (which costs over $420/month in payments). And it’s here that it starts to look better for the selling argument. Selling the car for $13k and having $130/month in Zipcar and public transportation costs gives me 100 months of costs paid for. That’s over 8 years! Let’s say I “only” get $11k for the car, and that my Zipcar and public transportation costs balloon to $200/month. I still have 55 months, 4 and a half years, of expenses paid for by selling the car. And all those numbers assume that I don’t ride my bike and that I use the Zipcar a lot! Suddenly, owning a car seems like a silly idea. I am going to have to seriously consider it. First, an update on the 100 pushup challenge. I managed to struggle my way through week 4, and I’m moving on to Week 5. However, I did my max pushup test (39, even though I might have managed to squeeze out one or two more) last night, so I won’t actually start week 5 till tomorrow. Also, I have attained “bronze” level on the President’s challenge. Not too shabby. Tomorrow is going to be a big night. Our neighbor is coming over to babysit the kids, and Lisa and I will be going out to dinner. A real sit down dinner, with reservations and everything! As part of the fun, I’m going to go pick up a Zipcar to use for the evening. I mean, who wants to go out on a date in a minivan? So I’m going to go pick up the Mini Cooper and we’ll scoot around town in that for the night. We’re heading to Et Voila, a Belgian restaurant. I’m excited to try their mussels, and Lisa will have plenty of desserts to choose from. 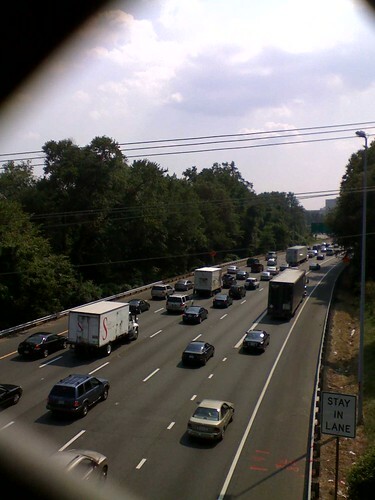 The Beltway, getting stacked up already. 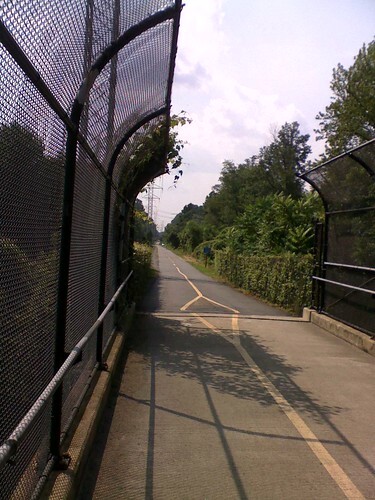 The W&OD Trail, no traffic here. The sun is starting to come up later now though, so soon enough, I’m going to have to either start delaying getting to work, or get a stronger headlight for the darkness. No thanks to Congress moving daylight savings to November! Week 3 of the One Hundred Pushup Challenge was a killer. I tested into the “> 25 pushups” portion after doing 30 on Sunday, and immediately on the first day, I had to start with 25 pushups for just the first set! It doesn’t get easier, as you have 60 seconds to recover and move on to 17, 17, 15, then 25 to finish up. My form was… not good. But I pretty much finished it. Eventually on Day 3, this morning, I had to do 30, 22, 22, 20 and 27. I barely eked my way through that, leading me to consider redoing the week. However, after looking ahead to week 4, I realized it wouldn’t be that much more than I did this week, so I will forge ahead and see how I do. On the President’s Challenge side, I’m now 86 % of the way toward the goal of 20000 points for a Bronze Award. I should be able to surpass 20000 by the end of next week. On Monday morning, I’ll be headed downtown for the Zipcar Low-Car Diet kickoff. If anyone happens to be near Gallery Place around 9am, stop by and say hi. The requirements are pretty simple: don’t use your car for a month, and see how it goes. I have to send them email updates every couple of weeks, and I might record a video of my commute or our trips to the market or something. In return, I got a free Zipcar membership for the year, $150 driving credit for Zipcars, $250 MetroCard for riding the train or bus, a copy of How to Live Well Without Owning a Car (which I already read and own a copy of) and a free one year membership to the Washington Area Bicyclists Association. Not a bad haul, I must say. That MetroCard should definitely help on those bad weather days. Who knows? Maybe I can eventually sell our second car. A couple of weeks ago while browsing the Fatwallet forums, I stumbled across what seemed like a sweet deal: Sign up for the Zipcar “Car-Free Diet” plan. You agree to keep your car keys in your junk drawer for just one month, from July 21st through August 15th. In return, you get a loaded public transit pass, a free 1-year Zipcar membership, some driving time and more goodies that we’ll tell you about a little later. Seemed like a no-brainer, so I signed up and waited. And waited. Turned out, they only took 30 people from each area, not everyone who signed up. But, lo and behold, I was one of the chosen 30! Schweet! So on July 21st, I’ll be downtown for the ceremonial key-relinquishing (they give them back, but I don’t anticipate needing them). Coincidentally, that night, Lisa and the kids will be flying home from Detroit. Luckily, they are arriving at National airport, so we can take the Metro back. I could also potentially pick them up in one of the Zipcars, but the kids do love the train. As I mentioned in my last post, I’ve done damn well riding my bike to work pretty much every day, so I don’t think it’ll be a big deal to keep doing so. The fun part will be the stuff I send in to them to document my experience. I’m planning on taking pictures of the receipt from my last gas fillup (June 26), my odometer which shouldn’t move, and maybe some video of my ride to/from work, especially the part where I pass over the packed Beltway while on the trail. It should be a lot of fun. I feel obliged to mention that yesterday, a young woman riding her bicycle was struck and killed by a garbage truck in DC. The driver apparently never saw her. There is also apparently a bike lane on this road, but it’s not clear whether she was riding in the bike lane or not. Either way, it’s certainly a wakeup call to everyone to pay attention when riding, driving, or walking. My heart goes out to her family. Ride safe out there everyone. Since we just finished the process of buying a new car (and I still haven’t had the chance to take any pictures), I thought I would share some tips about how I went about trying to get the best deal. First, I had some things set up in advance of making any contact. I have a GrandCentral phone number which makes it very easy to avoid phone calls until you are ready to talk to them. When someone calls that number, I can set it to ring my phone at work, home, or cell, or none of them (straight to voicemail). Even once I pick up the phone, I can choose to listen in as they leave a message instead of talking to them, and if I want, I can even connect to them while they are leaving the message. This was a definite sanity saver. I’d also recommend either setting up a special Gmail address to control the flow of emails, or to be very diligent about monitoring your inbox. The emails came in fast and furious, but I set up a good labeling system and used the Folders4Gmail Greasemonkey script to keep everything well organized into subfolders. Creating filters to label messages as they come in is also recommended, but you’ll probably need to get few emails first in order to set them up properly. Now, on to the process. I should also mention that we did a little bit of used minivan window shopping at CarMax and AutoTrader.com and found that the prices on used Odysseys (without negotiation) were really not that much lower than new ones. So, we knew we wanted a Honda Odyssey EX-L. Luckily, Honda doesn’t really have the multitude of options packages that other makers do, so it was easy to inform everyone of exactly what we wanted. I went to the Honda website, and put my zip code into the dealer locator. I got back a list of fifteen dealers in the DC area and went about contacting each through their website (pretty much all of them put you through a website form, as they didn’t list email addresses on the site). For those that had a comment field, I used FiveCentNickel’s form letter and told them exactly what was going on. For those that didn’t have comments, I quickly followed up after they sent me an email with the same form letter. After gathering all the initial quotes, I was able to weed out some of the higher offers, as I knew they were probably not going to be able to compete. I selected a few of the mid-range offers, and emailed them back with the lowest price quote. This is where things got a bit difficult. As you’ll see below, some dealers dropped out, which scared me into wondering if I wasn’t near the bottom of the market already. Others simply wrote back and said they would match, or beat it by $100. Not exactly what I was looking for, but it got me started in the right direction. After haggling a bit with them, I went to my next tier of quotes, which were slightly above the lowest, to see if they would go below my new low quote. At this point, I was $200 below my initial low offer. Then suddenly, one of these dealers came back and said that Honda had raised the dealer incentive by $500, and my new low quote was $400 under the first round. At this point, I wasn’t too worried about hitting the bottom of the market, and just wanted to either get someone close to me to get a reasonable low bid, or get down to the very bottom with one of the further dealers. I used a variety of email strategies at this point, griping about the distance I’d have to travel, or the colors remaining, anything to try to spur activity. I knew I was close to the end when one dealer not only dropped out of the bidding but actually said, “I can’t do that price, and I don’t think that other dealer can either.” I did a little more research and found this FatWallet thread about negotiating with dealers. My target price ended up being $26389, and since my low offer was $26400, I knew I was close. I finally emailed the two dealers I had been saving for last. One was a nice guy, but far away, and the other was my nice local guy. The distant guy reluctantly came down to $26200, but said, of course, that he’d be losing money if he made the deal. I went home early on Friday and gave my local guy a call and asked if he could do $26200, and he quickly checked and said yes, with no guilt trip about losing money. We packed our stuff in the car and headed over to pick up our new minivan. A couple of things I would do differently. First, I would wait until 2-3 days before we were ready to buy, and I wouldn’t have started on a Friday like I did. Dealers work on weekends, and I wasn’t ready to do anything that first weekend. Your best leverage is when you can say, “Get me this price, and I will be in today.” I had to keep delaying the decision, which frustrated me and the people with whom I was trying to negotiate. Second, I wouldn’t bother with any of the “buying services.” The only thing that got me was an extra quote that was right around the starting point for negotiations, and way higher than where I ended up. Maybe different situations would work differently, so don’t let me scare you off. Just know that if you put in a little effort, you can probably get a better deal than their “convenient” service. I also might have tried to buy a little bit earlier in the year. I know a couple of dealers were completely out of 2007s by the time I got to them, and one or two more were down to their last 2 or 3 and weren’t as willing to deal (I know, seems paradoxical). So for us, late November was a bit late for buying an Odyssey. Other models may differ (I know they had a LOT of Accords left), so if you’re looking at using the changeover from one model year to the next to your advantage, start checking dealer stock in September so that you can be prepared to start looking early if they are running low.